July 13th will see the premiere of yet another vampire TV show: Guillermo del Toro’s The Strain on FX. I haven’t read the books on which the series is based, but going by the Wikipedia page, The Strain marks a sharp departure from the modern trend of handsome, charming, almost-human vampires that young ladies will swoon for – and a return to the vampire as a creature of horror. I guess most of my tips on mating and dating vampires (chapters 1 and 2 of Economics of the Undead) will prove useless here. The Strain Wikipedia page (again, my only source) also indicates that Strain vampires share a form of hive mind with the Ancient from whom they are “descended” as well as all other vampires of the same line. 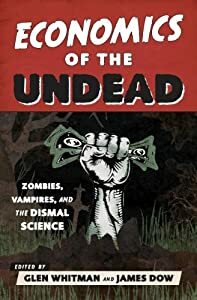 This raises an economic question that doesn’t arise in Economics of the Undead: could central planning work better for the undead than for humans? There is fairly broad (though not universal) agreement among economists that central planning fails in human societies, like the USSR and Maoist China, for two primary reasons. First, humans lack the incentive to follow the dictates of a central planner, preferring instead to pursue their own interest as they see it. Second, central planners don’t have access to the local and often tacit knowledge of economic circumstances (preferences, resource availabilities, and technologies) that is dispersed among thousands of people. The price-and-profit signals of a decentralized market society help to solve these twin problems. But both problems might fade away in the context of a vampire hive mind; all the knowledge of the hive is automatically shared via telepathic link, and all incentive problems vanish in the face of mind control by the Ancient in charge. As a result, the community of vampires descended from one Ancient might become a successful communist society, just like a bee hive or ant hill. However, the Wikipedia entry also implies (without saying outright) that each Ancient’s hive mind is separate from every other Ancient’s hive mind. If so, and if there are enough Ancients alive and trying to interact with each other, then the community of Ancients might need to rely on a decentralized market to coordinate their activities after all. This entry was posted on Friday, June 20th, 2014 at 12:23 pm	and posted in Uncategorized. You can follow any responses to this entry through the RSS 2.0 feed.